Sample Capacity: 3 Samples and one 8mm provision for Test Tube, for the determination of Boiling Point of Any Liquid. Visualization Technique Suitable for Dark Colored / any colored samples. Silicon Oil Bath Heating Type, Temp. 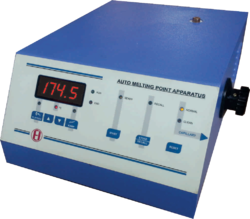 Digital Melting Point Apparatus is a compact instrument designed for accurate determinations of melting points of solid samples. Bath: 100ml Oil Bath with Level mark. For Boiling Point: Mini Test Tube 1 No. For Melting Point: Samples Capillaries 3 Nos. With resolution 0.1 degree C to measure melting point/boiling point of solid and liquid samples. Temperature range 0-300 degree C with 4 digit LED display. Automatic Melting Point Apparatus, Microprocessor based High Precision. Melting point is Displayed on 3 1/2 digit display on front panel. Automatic Furnace cut off with audio and Visual indication. Range 40c to 350c, readability 1c. Fully automatic operation. 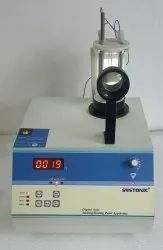 - Built-in magnetic stirrer with electronic speed controller. - Electronic controller for adjusting the heating rate.